Seldom do we find a quilt pattern with just one name. This pattern has been called many. Just a few are Jacob’s Ladder, Underground Railroad, Road to California, Off to San Francisco, Gone to Chicago, Stepping Stones and Trail of the Covered Wagon. All these names have one commonality; they all speak of going somewhere. It’s fun to imagine what might have inspired these names. It may be a trip through the garden using stepping stones or it might be the long journey west in a covered wagon. Women might well have dreamed of traveling as they were sewing on this quilt. When Marie Webster wrote the first known book on quilting in 1915 she referred to the Jacob’s Ladder pattern in this way, “The bold and rather heavy design known as ‘Jacobs Ladder’ is a good example of a pieced quilt.” She showed a black and white picture of this pattern with the caption, “One of the most striking quilts having Biblical names.” Biblical names were often used for quilts in a time when reading the Bible each day was a part of family life. Finley was the first to mention the same pattern was sometimes called the Underground Railroad. She further romanticized the name Underground Railroad by describing how it brings to mind a picture of, “Eliza of Uncle Tom’s Cabin crossing the ice from Kentucky to Ohio, whence the underground railroad carried runaway slaves to the promised land of Canada.” We know that this pattern was unknown during the pre Civil War days of the Underground Railroad. But considering Finley grew up in Ohio she might well have heard stories of this pattern in connection with Ohio’s part in assisting escaping slaves. You should always remember FINISHED SIZE means the size it will be in a completed quilt. The measurements given already have the ¼ inch allowance included. 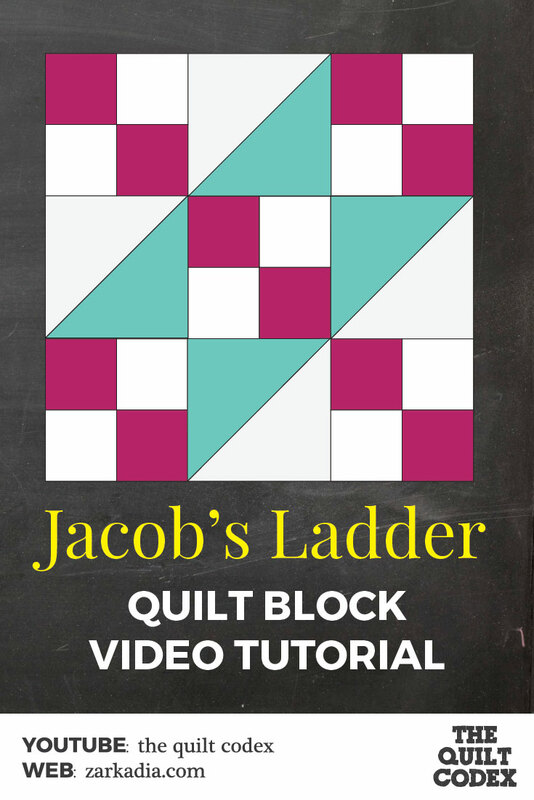 These are three exact variations of the Jacob’s Ladder quilt block that can be made using the instructions given in the video tutorial. The only thing you will be changing is the placement of the different units of the quilt block. There are more variations of the block, but only these 3 match exactly the tutorial.